Washington – A Senate panel Wednesday began the first of four hearings aimed at finding ways to shore up the Affordable Care Act’s fragile insurance markets, but reforms could be limited and come too late to help Connecticut’s marketplace, Access Health CT.
Insurance commissioners from the states of Washington, Tennessee, Oklahoma, Alaska and Pennsylvania – both red and blue states – told members of the Senate Health, Education, Labor and Pensions (HELP) Committee that states need more help from the federal government to stop the spiraling of premiums and the flight of insurers from the ACA’s state exchanges. While everyone agreed Congress should take steps to stabilize insurance markets, partisanship was seen as a stumbling block. Sen. Patty Murray, D-Wash., the panel’s top Democrat, said senators “have a very narrow window” to implement reforms before Sept. 27, the deadline for insurers participating in the federal marketplaces to sign contracts for the coming year. Connecticut’s ACA exchange, Access Health CT, has lost two of the four insurers that sold policies to individuals and small businesses on that marketplace. The two remaining insurers, Anthem and ConnectiCare, have asked the Connecticut Insurance Department for hefty premium increases for the 2018 enrollment year and say they are not certain they will continue to participate in the Connecticut exchange. Not having an insurer on the exchange would prevent more than 70,000 individuals and families in Connecticut from receiving subsidies that help them pay their monthly insurance premiums, including about 46,000 low-income residents who also get help with out-of-pocket costs like copayments and deductibles. Murphy questions Tennessee Insurance Commissioner Julie Mix McPeak. The insurance commissioners agreed on two things: That there should be a commitment to federal cost-sharing reduction payments to insurers that allow them to cut out-of-pocket health costs for low-income Americans — President Donald Trump has not promised to continue these payments – and there should be more flexibility in a waiver program that allows states to opt out of Affordable Care Act requirements. Alaska, Hawaii, Minnesota, California, Vermont and Oklahoma have received “1332” waivers, named after a section of the Affordable Care Act, to modify the way the health care act is implemented in their states. About 20 other states are in the process of applying for these waivers. Teresa Miller, the insurance commissioner in Pennsylvania, testified the current process to apply for a 1332 waiver, “is too cumbersome” and asked Congress to allow applications to be made through a letter from a governor instead of requiring a state legislature to approve a law requesting the waiver. Several states, including Oklahoma, Alaska and Minnesota, have used 1332 waivers to establish reinsurance programs that protect insurers from unexpected risks in order to lower premiums. Washington state is considering establishment of a “public option” – or state-run health care plan — in counties that won’t have an insurer in the 2018 enrollment period . Other states are asking Congress to allow those living in underserved counties to buy into the Federal Employees Health Benefits plan, giving residents in rural areas access to the same health care as federal workers. Connecticut is not considering a 1332 waiver to shore up Access Health CT, at least not at this time. The state has empaneled a bipartisan group to study ways to cut the cost of health care in the state. The lieutenant governor’s office, however, said it would not speculate on what the state would do if Access Health CT loses one or both insurers. 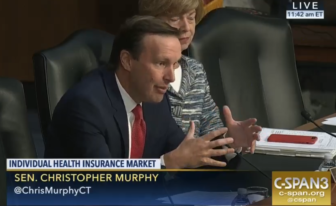 Sen. Chris Murphy, D-Conn., a member of the congressional HELP panel, asked Tennessee Insurance Commissioner Julie Mix McPeak whether the nation’s ACA marketplaces are as shaky as Obamacare critics say. “The rhetoric gets overheated about the stability of the exchanges,” Murphy said. McPeak had testified that the ACA marketplace in Tennessee was “very near collapse” last year. “You were on the verge of collapse…but you didn’t collapse,” Murphy said. McPeak said the situation in her state remains dire. “Seventy-eight of our 95 counties have one option, and that’s not where we want to be,” she said. Murphy also asked about the impact of the Trump administration’s decision to cut the Affordable Care Act’s advertising budget by 90 percent, to $10 million, and reduce spending on groups that help customers purchase the appropriate insurance plan on state ACA exchanges. The senator said there seems to be a “direct correlation” between a drop in federal marketing of the ACA and enrollment. The HELP Committee hearings, which will continue Thursday with the testimony of a bipartisan group of governors, follow the failure of GOP congressional leaders to overturn key elements of the ACA in July. Alexander said it may be possible for Congress to approve a short-term, narrow reform bill that would include giving states more flexibility to obtain 1332 waivers and providing funding for cost-sharing subsidies to insurers for 2018.